The relationship between the open source community and Microsoft continues to evolve. Last Tuesday Brad Smith, Senor VP at Microsoft, gave a presentation at this year's Open Source Business Conference that struck quite a different tone from what he said in an interview with Fortune a year ago, according to a blog by Charles Babcock. If you need high resolution geospatial data from the world's leading commercial sources including high resolution imagery from Digital Globe, vector data from Navteq, DEMs from Intermap, and weather data from Weatherbug, take a look at High Resolution Geospatial Data. At GITA in Seattle this year I attended two sessions on what I consider to be one of the most important government initiatives in the area of geospatial data, national data models (my term). In the US national data models include Department of Homeland Security - Geospatial Data Model (DHS-GDM) and DoD's venerable SDSFIE data model, which is also an ANSI standard. In Canada the national data model that appears to be emerging is the National Infrastructure Data Model - the data model is actually defined in Natural Resources Canada, Critical Infrastructure Information Identification, Project Report, Version 4.2, January 29, 2008. At GITA there was a session on the DHS-GDM led by Greg Gardner, Oracle Corp. Paula Rojas and Philip Dawe of GeoConnections presented a session related to the Canadian NIDM model. The DHS-GDM and NIDM seem to be primarily motivated by emergency planning and the need to be able to exchange information rapidly and efficiently between local and state and provincial governments. SDSFIE seems to be motivated more by an operational requirement for exchanging facilities data within DoD. The reason I believe these national data models to be so important is that with every emergency, like the pipeline accidents (Bellingham and El Paso gas) that motivated the Pipeline Safety Act, government moves in the direction of mandating the capture and exchange of more digital data about national infrastructure. Government is also motivated to act to ensure uninterrupted communications, transportation, power, water, and other essential services. For example, in 2004 in the UK an act was passed called the Traffic Management Act which will come into force April 1 which will require utility companies and local authorities to report digitally the location of street-works activities in England and Wales. The motivation for this act is to help reduce disruption for the travelling public. My own perspective, which I believe is shared by many people, is that national data models should build on and not replace existing standards such as LandXML , Industry Foundation Classes (IFC) , Open Geospatial Consortium, and others, which are already supported by vendors and recognized by government organizations including for example, virtually all state and provincial DOTs. Otherwise I am very concerned that these initiatives run into the risk of becoming another SDTS (US) and COGIS (Canada), for those of you that can remember. I just saw this article US Navy to Require Open Standards on James Fee's Blog . It means that increasingly the Navy will acquire systems based on open technologies and standards. This was announced March 5 by Vice Adm. Mark Edwards, deputy chief of naval operations for communications. One of the key objectives is to break down "stovepipes of data so that we can share information across domains.” This highlights how important standards have become in the US Federal Government and in governments the world over. 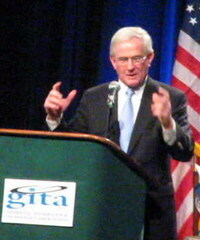 GITA 31 just kicked off this afternoon with a fascinating keynote by Tom Murphy, former Mayor of Pittsburgh. He made a number of interesting points but there are three that really hit the mark with the audience. The first is that the Ozzie and Harriet life style that most North Americans have grown up and assumed is being threatened. Tom introduced the subject by asking the audience how many changed their lifestyle when gasoline reached $3.00/gal. A few hands went up, but when Tom asked how many were going to make some changes to their lifestyle when gasoline hits $10/gal, many more hands went up. Tom's point is that the North American lifestyle identified with Ozzie and Harriet is founded on cheap oil, and as oil prices continue to rise we are going to face profound changes in how we live and work and get between the two. 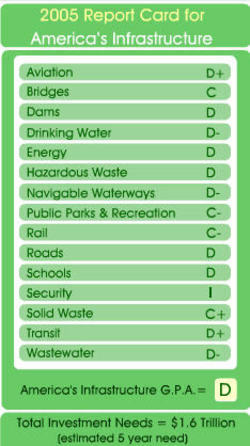 The second important point that Tom made was the deplorable state of American infrastructure, and as evidence of this he pointed to the the American Society of Civil Engineers' (ASCE) Scorecard for America's Infrastructure. All three of the remaining presidential candidates in the US have mentioned the problem of aging infrastructure. The Federal Highway Trust Fund — supported by a tax on gasoline — is up for renewal in 2009, and that may be an opportunity to motivate a national discussion on infrastructure renewal. 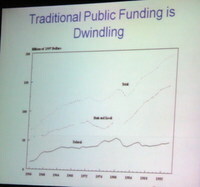 The third point that Tom made is that traditional sources of funding for infrastructure are drying up. The Federal government is basically out of the picture, but local and state governments have become creative in finding new ways to fund infrastructure projects. He mentioned several examples where several local governments have joined forces to share tax revenues to support infrastructure programs. In St Paul Minneapolis 188 municipalities and 7 counties share 40% of t heir tax basis. In the Cleveland area five counties pooled tax revenue to support the Cleveland Metroparks system. In Denver the Fastrak Referendum approved a $2B bond issue shared by seven counties and 32 municipalities for 119 miles of light rapid transit to protect what people like about Denver. The MapGuide Open Source project team has released MapGuide Open Source 2.0.0. The primary new feature of this release is Fusion, a template-based system that abstracts presentation from model and controller. You'll find significant performance enhancements as well. You can see all the new enhancements at MapGuide OS 2.0 Features . To download MapGuide OS 2.0 go to MapGuide 2.0 Download.